“Study for Sidewalk Kintsukuroi #01 (New Haven, Connecticut),” photograph with enamel paint and metallic dust. As part of an ongoing series titled Sidewalk Kintsukuroi, artist Rachel Sussman (previously) brings the Japanese art of kintsugi to the streets. We’ve long been enamored by the ancient technique that traditionally involves the process of fixing broken pottery with a lacquer dusted or mixed with powdered gold, resulting in an a repair that pays homage to the object’s history. In the same way, Sussman’s kintsugi series highlights the history under our feet, bringing attention to the imperceptible changes that take place over time in the world around us. Though even the repairs are impermanent and will eventually be lost to wear and tear. 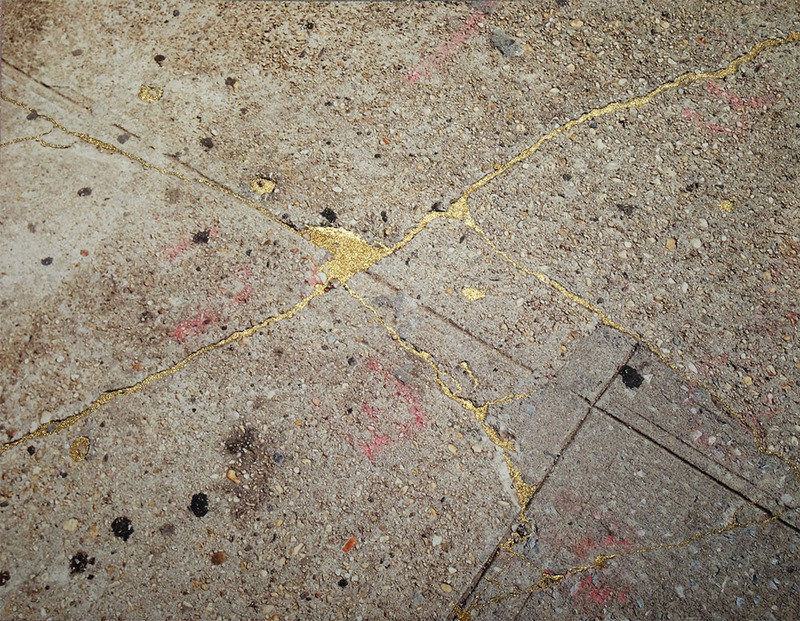 “Study for Sidewalk Kintsukuroi #09 (SoHo, New York),” photograph with enamel paint and metallic dust.